I'm very excited to announce that I'm on the Lacy Sunshine Challenge blog team! Today is my first post. I love Lacy Sunshine images, so this will be a super adventure for me! The theme this fortnight is "Back to School". In the small town where I live, the kids start back Sept. 1, so we are right on schedule with this challenge! 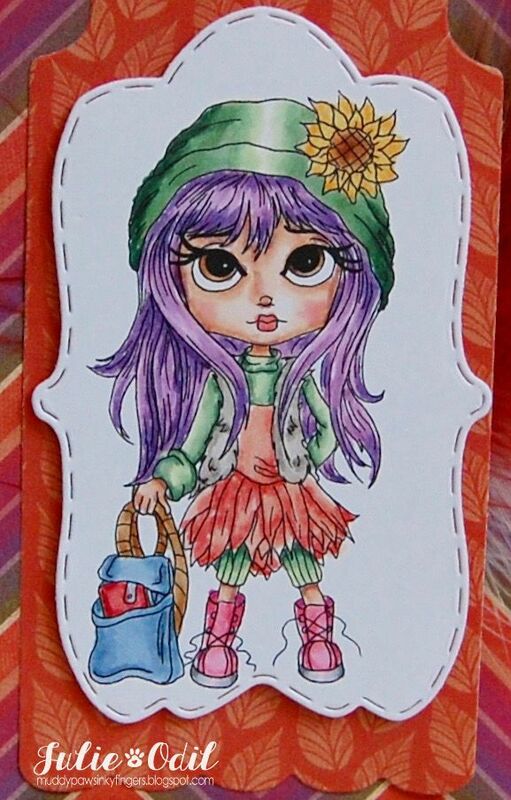 This Lacy Sunshine image is Zoe Back to School. I colored her with Copic markers. She is ready for whatever her teachers throw her way! 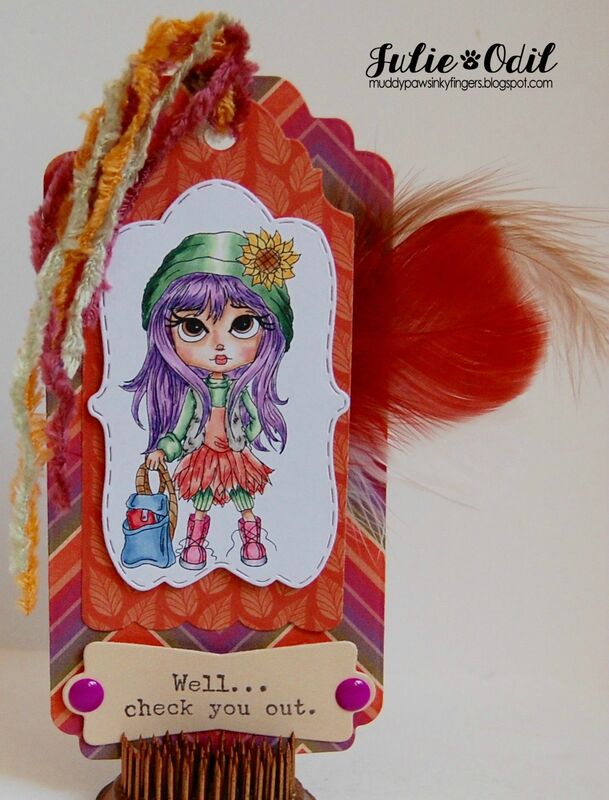 I used Sangria papers from Close To My Heart to make the bookmark, and dies from Paper Wishes and Craftin' Desert Divas. The enamel dots are from My Mind's Eye. The fibers are CTMH. The sentiment is a stamp of the week from Unity Stamp Company. Feathers are from my stash. Please join us the next 2 weeks for our 'Back to School' challenge at Lacy Sunshine Challenges. I'd love to see what you make! Beautiful tag, cute image lovely bright colours and great design! The feather and fibres look gorgeous, I can see you're going to be a great asset to your new DT! I love tags and this one is super cute! Thanks for joining us at The Sisterhood's 'School Time' challenge! What a fabulous idea Julie! Looks awesome! Thanks so much for joining us at The Sisterhood’s ‘SCHOOL TIME’ challenge and please come back again soon! Beautiful tag! Love the colors and papers! Thanks for joining us at 4 Crafty Chicks this week! What a fantastic tag! Lovely colours and design! Thank you for joining us at TTCRD ! Beautiful and colorful tag, beautiful coloring! Thank you for joining us at The Sisterhood for our School Time challenge! love the textures & bright colours. Thanks for joining us for our 'Anything Goes' challenge #39. Sweet card!! Thanks so much for participating in our STAMPING BOUTIQUE challenge!!! Can’t wait to see you participate again in our next challenge! !